NEW YORK, NY; DECEMBER 9, 2015—Over the next few days I’ll post some prognostications on various sectors of the licensing business. While I (and everyone else on the planet) have written plenty about Star Wars in recent months, that is unquestionably the story of the moment. So let’s start with a look at the impact Star Wars is having on entertainment licensing and where the market is headed. Looking at 2015, Star Wars has been the best news in entertainment licensing and, assuming the movie performs as expected, will likely be the entertainment segment’s blockbuster for 2016 as well. But Star Wars has also been the worst news in licensing for 2015, sucking the juice out of every other pop culture property this year, likely keeping even hot newcomers such as Nickelodeon’s Paw Patrol from realizing their full potential, and holding back other retro properties that have had difficulty gaining placement at retail, such as Iconix’s Peanuts. Minions has held strong. But Superheroes? Maybe their powers aren’t infinite, at least in the licensing universe (and maybe those powers were diminishing even before the Star Wars onslaught). 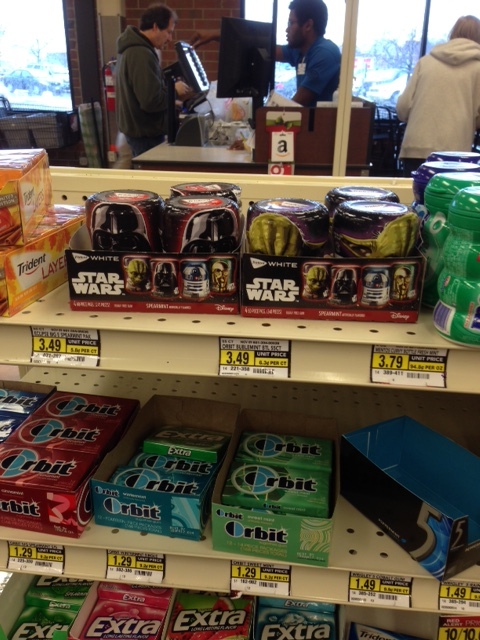 From Hudson newsstands at airports to Nordstrom’s children’s department to Walgreens, Star Wars is ubiquitous and has been since back-to-school. I wasn’t monitoring the licensing business in 1977, but this is the movie credited with initiating the modern licensing business. Given the institutionalization of licensing today, and the Disney machine behind Star Wars now, we’re no doubt looking at a licensing blockbuster of a whole different order of magnitude. Today, for manufacturers and retailers waiting to release merchandise with the new movie’s art — remember, so far, with a few notable exceptions such as the BB-8 Droid, it’s been all classic images — it’s a matter of waiting for the force to awaken and do its part. What will the net effect be on entertainment licensing for 2015-2017? Star Wars does not appear to be carrying the rest of the business up with it. Rather, it is displacing just about everything else. Still, in the aggregate it is more than compensating for others’ lost growth or stagnation, which is why entertainment licensing overall will show substantial growth for 2015 and probably 2016. Licensing today is generally a matter of who are you going to knock off the shelf in order to get on. 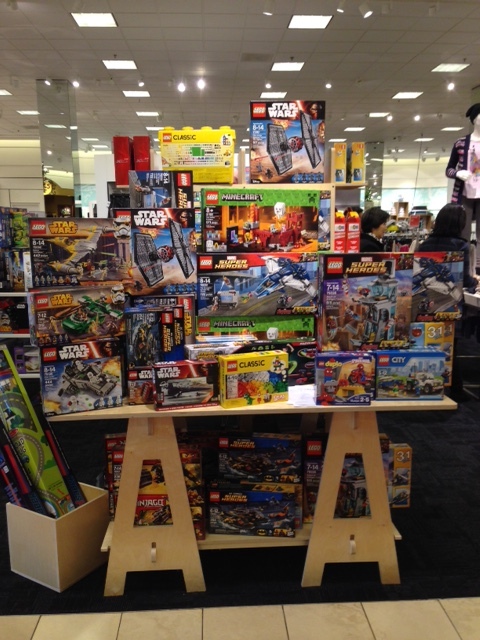 Star Wars is different, though: In addition to usurping others’ shelf space, Stars Wars found new distribution (such as at Nordstrom and Hudson) that hadn’t been given over to entertainment toys, apparel and collectibles to this degree before. That is enlarging the segment as a whole. If the movie does indeed perform as expected, Star Wars will also be the worst news in licensing for everyone else in 2016 and, for Disney, an even worse story for 2017. Why? Once Star Wars merchandising runs its course — and it will run its course — Disney will have to replace the Star Wars licensing juggernaut with something else. Even though there’s another movie scheduled for 2017, the second release in a series never generates the same in merchandise sales (and rarely at the box office) as the first. If superheroes are still in style — and that’s a big “if” — Disney will have Marvel to fall back on. Or perhaps they’ll have another Frozen. But it’s hard to bet on those scenarios. The good news is that once Star Wars does run its course, that should re-open the shelves to other entertainment properties, and there’s no dearth of those in the wings. Ira’s Fearless Forecast: Retail sales of licensed merchandise based on entertainment properties in the U.S. and Canada will be up 7%-9% for 2015. Ira Mayer, former publisher and executive editor of The Licensing Letter, conducts competitive research and consults for companies in the licensing business; you can contact him by clicking on the “Contact” button at left. NEW YORK—November 6, 2015: Iconix is re-stating its financials for 2013, 2014 and 2015 with a net impact of about $3 million. Ultimately not a huge amount for a public company, but enough to send the stock plummeting 58% today as of 1 p.m. Results for the quarter and year-to-date will be released Monday, but essentially the bad news is out. And it’s no surprise. (See my previous post on Iconix last August for more on the company.) The company also noted that an SEC inquiry into its 2014 financials continues. Meanwhile, no one has been announced as a permanent replacement for founder/ex-CEO Neil Cole, and although the Peanuts movie opening today, which the company has been betting on to turn its fortunes around, is getting good reviews, they’re not money reviews. “Pleasant” isn’t the sort of adjective that brings out the masses (kind of the equivalent of “she/he has a great personality”), and Iconix is revising downward its forecast of licensing revenues for the year yet again because of Peanuts, because too many of its fashion brands aren’t cutting it at retail, and because of soft performance in key European and Chinese markets. You’d think Star Wars was the movie opening today, but that’s got more than a month to go. 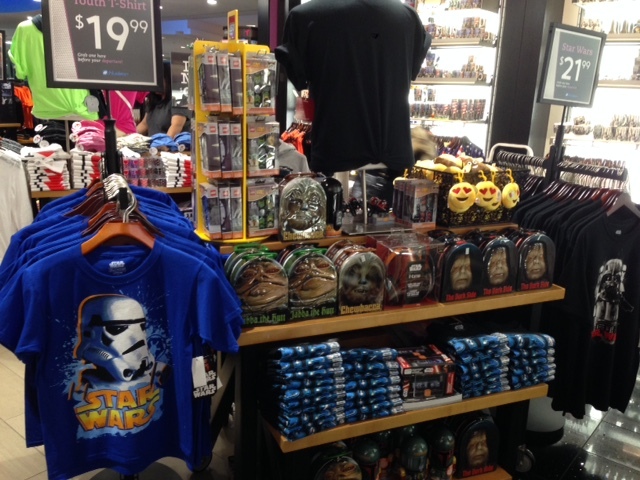 Iconix is surprised that Star Wars is getting the amount of shelf space it is already. Hard to know what galaxy they’ve been hiding under. In a Barnes & Noble in Brooklyn Heights, NY, there are 17 linear feet of tables alongside the escalator that are pure Star Wars, with another 3-4 places around the store offering still more. 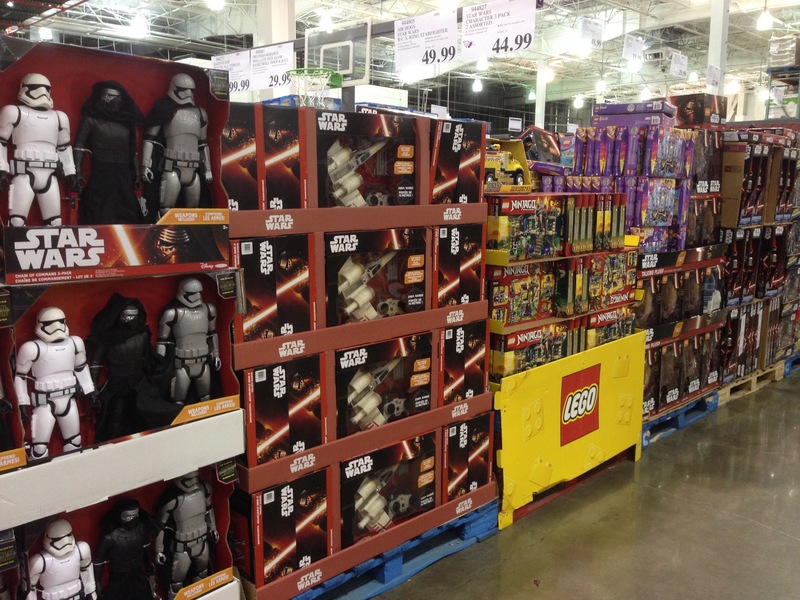 At Costco two properties dominate the toy aisles: Star Wars and Frozen, the latter the property Disney credits for its strong consumer products performance year-to-date. 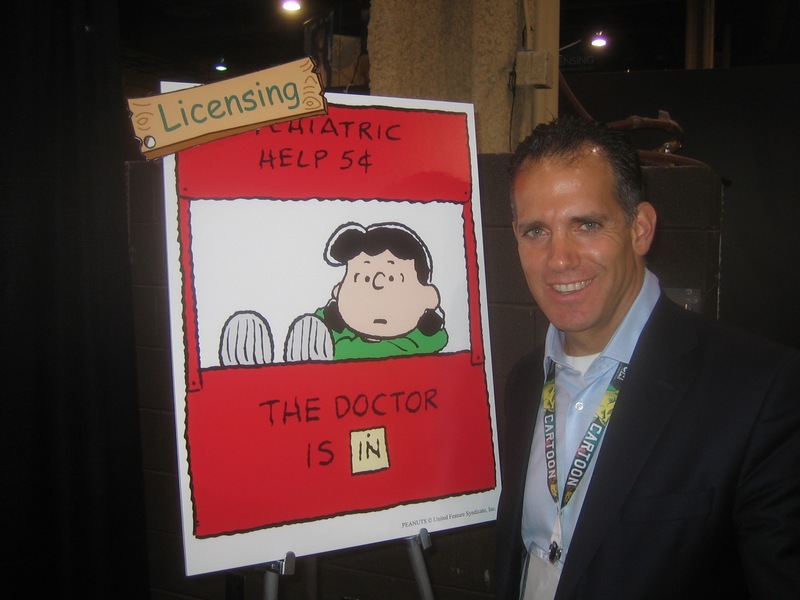 Lucy with licensing agent Stu Seltzer of Seltzer Licensing in the mid-2000s. About 10 years ago, when Peanuts was still licensed by United Media and I owned and published The Licensing Letter, I was granted permission to use a classic panel of Lucy in a lemonade stand to adorn our booth at Licensing Expo. We had invited various licensing consultants to be “Licensing Doctors,” advising newcomers on licensing strategy. We couldn’t change the wording on the actual panel, but we were permitted to attach a little piece of “fence” to get our message across. Feels as though there’s some irony in there somewhere. Wonderful to wake up to a front page NY Times story about the success of University of Alabama licensing, the first two words of which are “Bill Battle.” Battle, now 73 and truly one of the stars of the modern era of consumer products licensing, played for Alabama in his day. In 1970, at 28, he coached the competition at Tennessee. He founded Collegiate Licensing Company (CLC) in 1981, building the company to handling licensing for about 200 of the leading colleges, universities and conferences before selling to IMG in 2007 for a reported $100 million (IMG is now part of WME). Since 2013 Battle heads the Alabama athletics department. Great to see him get this kind of national recognition. The article, incidentally, notes that CLC guaranteed Alabama $9 million in royalty revenue from sales of licensed merchandise for this year (translate that to about $200 million at retail), and $103 million through the 2024-2025 season (in excess of $2 billion at retail over the next decade). Activision Blizzard, which is acquiring Candy Crush developer King Digital, is forming a studio to develop movies and TV shows based on the properties it owns, including Candy Crush, Call of Duty, and Skylanders. Unit is headed by Nick van Dyk ex-SVP corporate strategy for . . . Disney. China’s State Administration for Industry and Commerce is endeavoring to stamp out counterfeiting of Disney merchandise. Unusual for a crackdown like this to focus on a particular company’s IP, but (a) Disney is such a huge chunk of the market and (b) the company is building a theme park in Shanghai. Seems like all roads, no matter where, lead to the House of Mouse. Is Star Wars the (Old) New Frozen? In the decade following the release of the original Star Wars movie in 1977 the licensing business overall grew more than 10 times, from $4.9 billion in retail sales that year to $54 billion in 1986, according to The Licensing Letter Databook. Star Wars is credited as the catalyst for much of that growth — certainly in the entertainment sector, but across the rest of the licensing business as well. In recent years, worldwide retail sales of merchandise based on the Star Wars characters and imagery has hovered in the vicinity of $2 billion annually. So as the rollout of new Star Wars merchandise begins this Friday, with a new movie coming in December, what are the prospects for Star Wars sales now? A widely reported bullish analysis of Disney’s stock by Macquarie Securities analyst Tim Nollen puts the number at $5 billion in the first year following release of the movie (which is a funny time to start counting, since the merchandise is going on sale more than three months before the movie comes out). Good forecast or is Nollen building unrealistic expectations for investors? “Star Wars is on a whole other level from anything we’ve ever done,” Dynomighty’s Sydney Pham told me at the NY NOW gift show in New York recently. 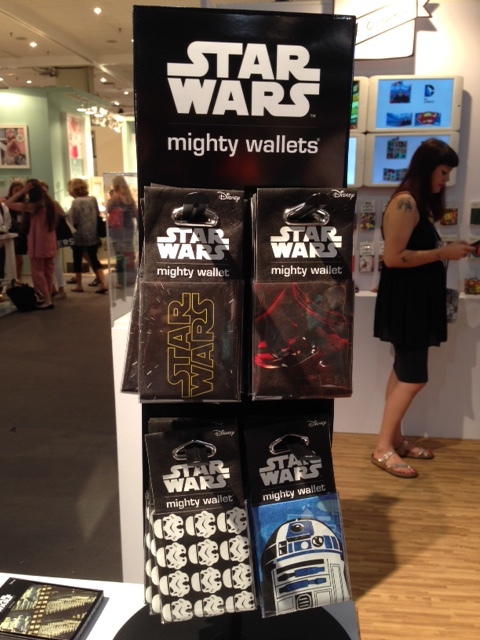 Dynomighty makes Tyvek wallets, passport holders, and other accessories, and festooned its booth with Star Wars displays. “We started pre-selling the classic images a month before the [mid-August] show; we’ll have new images from the movie for the spring. But even the classic images are outselling all of the best-sellers we’ve had for eight years,” Pham said. That’s pretty strong language. Joyce Washnik, editor of Giftbeat, a newsletter for the gift industry, sees Star Wars crossing all retail channels, including specialty gift stores which, traditionally, might not touch a pop culture phenomenon such as Star Wars because so much merchandise is available at Walmart, Target, and everywhere else. Still, Washnik says, gift stores had a great run with Frozen and she sees Star Wars following in those footsteps. Frozen did just shy of $1 billion in retail sales of consumer products in its first year following release, based on my analysis of various Disney statements over the past few months. And that was for a property no one had ever heard of and for which Disney probably could have done more had the studio, retailers, and manufacturers anticipated the immediate success of the movie. (Not being able to anticipate that is why movies and merchandising are art not science, thank you.) In the case of Frozen, the licensing program had to be revved up quickly in response to the movie’s wildfire takeoff; needless to say, Disney knew what to do. For perspective, Mickey Mouse and Hello Kitty do a little less than $4 billion each in retail sales of licensed merchandise annually, worldwide. Disney Princess and Winnie the Pooh are just below $3 billion each, and Cars and Star Wars have done about $2 billion each. Note that all but one of those — Hello Kitty — are owned by Disney. If the new Star Wars movie bombs, which seems unlikely, Disney will still have built momentum and had three months to sell the goods. That’s analogous to most fast food promotions which end before the movie opens…just in case. Using the loosest of calculations, $5 billion — which is greater than the value of the entire licensing business pre-Star Wars! — would be $2.5 billion at wholesale. Since royalties are mostly calculated on wholesale, and the rule-of-thumb for rough estimates across all categories is a 10% royalty rate, that’s $250 million net to Disney. Even if the royalty is higher (likely), it’s still not going to come to $500 million. But $250 million? Even Mickey wouldn’t sneeze at that. Good forecast or unrealistic expectation? As Robert Browning wrote, “Ah, but a man’s reach should exceed his grasp, Or what’s a heaven for?” Written for Star Wars, no? Will Minions Freeze Out Frozen, The Way Frozen Froze Out Everyone Else? Licensed Minions products will be everywhere in advance of the July 2015 release date for the Despicable Me spinoff, right in time for the all-important back-to-school season. The question for licensees and retailers is whether the Frozen short that Disney is releasing in front of Cinderella next month, and the complementary marketing the Disney machine will undertake until the next full-length feature, will keep Frozen dominant right through to the next movie or whether Minions can steal share of market the way Frozen did from Barbie, American Girl, and just about every other doll on the market in 2014.